Canadian Sport Centre Manitoba > Updates > Press Releases > Cal Botterill Lecture 2017: To Infinity and Beyond! Cal Botterill Lecture 2017: To Infinity and Beyond! 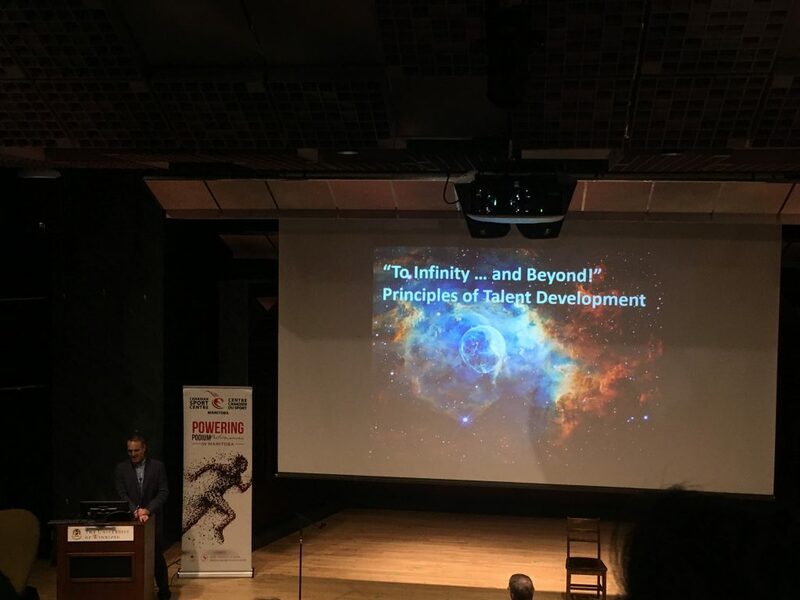 Dr. Wade Gilbert joined Manitobans for the Cal Botterill Lecture on Thursday evening, delivering his presentation To Infinity and Beyond! Principles of Talent Development. The lecture, held at the University of Winnipeg, marked the 11th year of the Cal Botterill Lecture Series. 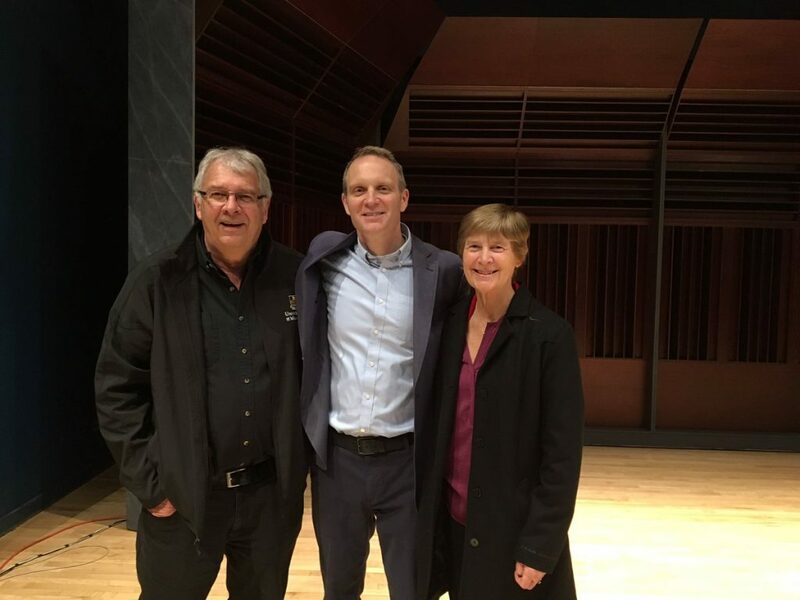 Dr. Gilbert is a professor at Fresno State University in Fresno, California and made the journey to Winnipeg last week to share his expertise and insight with coaches, educators, and members of Manitoba’s sport community. The free event was emceed by four-time Paralympian Colin Mathieson, and was attended by Olympic and Paralympic athletes, coaches, and support staff as well as students and other members of the sport community. Guests were joined by Dr. Cal Botterill, Doreen Botterill, and Jim Henderson. The evening began with the presentation of the Jim Henderson award. This year, University of Winnipeg professor and Mental Performance Consultant Stephen Dubienski received the award for his research on concussion recovery and work with bio and neurofeedback. Dr. Gilbert explained that nurturing personal mastery requires getting uncomfortable. The ‘sweet spot’ as he called it, is a point that exists where athletes do their best learning: one where they are challenged just beyond their limits, but feel supported by their coaches and teammates at the same time. Practicing ugly, making mistakes, and learning to treat failure and vulnerability as tools for learning will elicit growth and learning like nothing else. LOVE this! Practice dirty if you want to reach your potential! Dr. Gilbert spoke about setting few rules, but holding lots of expectations. Coaches need to create environments that are true to their core values. Gilbert suggested tying core values to everything an athlete does. Living core values in every day training environments and finding moments in each day to reinforce those values is key. From entering a training facility to routines and rituals, an environment of excellence, as Dr. Gilbert described, is one where a culture is more than just a slogan written on a wall. Provide the framework, allow freedom. Dr. Gilbert touched on the Complex Family Model, where structure and freedom are both offered. Standards in this model are fluid and lie on a spectrum, rather than being black and white. We learned that it is key to align our core values to everything we do. People who are constantly looking to improve themselves are clear on what they can sacrifice and what they won’t. Failure and mistakes are not weaknesses, and in fact become tools for self-improvement when we see them in the right light. A successful coach and athlete duo in this presentation use reverse engineering to better understand the strengths and areas of improvement in any given routine or practice. Dr. Gilbert made an important distinction between pushing yourself and achieving personal mastery: achieving balance is critical. In the world of youth sport, we need to stop focusing on number of hours and instead focus on the value of those hours. Changing the mindset of our athletes is the first step in allowing them to learn and grow. We can all become great; as long as we are given the right tools and environment. The growth of athletes – regardless of their age, stage, or ability – begins with coaches working to create a milieu where mentally resilient athletes can be groomed and have the freedom to flourish. Though comfort keeps us safe, greatness comes only to those who seek and embrace their own vulnerability. CSCM’s Dr. Adrienne Leslie-Toogood has been bringing speakers to the Cal Botterill Lecture since she founded the Lecture series in 2007.